Got up at 2:30 and our neighbour Cliff and his friend Terry, who was also going to the airport, picked us up at 3:30. The flights to London were uneventful, except that Maren got the time difference wrong, so that we spent an extra hour waiting at the gate, rather than sitting comfortably in the lounge in Lisbon airport. 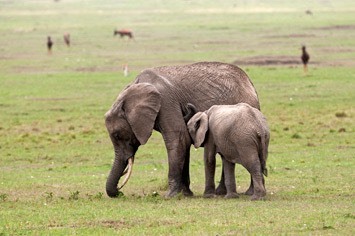 We were looking for some SMA Gold milk powder to take for the orphaned elephants, but we couldn’t find any anywhere in Heathrow airport. Not only was Boots not very well stocked, but the whole airport is not terribly nice. We managed to check in at 16:00 for Kenya Airways flight and even got access to the Business Class lounge with our Petroleum cards, despite only having Economy tickets! That was great, as they had comfy seats, nice food and free WIFI. The flight to Nairobi was fine. We arrived in Nairobi on time and to our surprise there was hardly a queue at the visa counter. We got through without any problems and didn’t need to wait long for our bags all four of which arrived safely. We were out of the airport by 7:30 (one hour after the plane landed), but there was no sign of Alfred, who was supposed to pick us up. We went and changed some money, and kept checking the signs held by people waiting to pick somebody up. About 15 minutes later, Alfred turned up and said that he was late due to traffic. He then drove us to the new Nakumatt in Karen, and on the way we saw our first mammals of the trip: a troop of baboons foraging at the roadside! In Karen we met up with Charles (www.emaiyansafariadventures.com), the excellent cook we had also taken on our previous safari, and Bella, the owner of the car we had hired (www.cruisingcruisers.com). 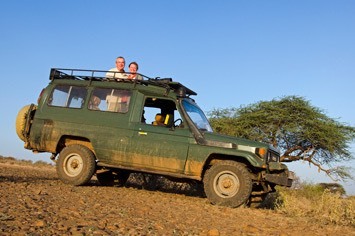 The car we had chosen was a long wheel-based HJ75 Toyota Landcruiser with a big roof hatch. It proved to be very capable, if elderly car. We had a mad trolley-dash around Nakumatt, buying everything we needed for the first few days of our trip, as well as some infrastructural stuff and a Kenyan SIM card from Safaricom for our mobile phone. After shopping, we drove to Indaba East Africa campsite on Muiri Lane in Karen (www.indabaexplorations.co.za/tour-info/campsite/), which at the time was mainly inhabited by Dutch people. We had a double room without a bathroom, which was off a dormitory and Charles had a bed in a dorm. We tried to have a siesta, but that was rather difficult as a team of mechanics were working on a couple of big overland trucks just outside our window while listening to loud music. We only managed to have a little bit of sleep and then enjoyed a well-deserved shower. In the afternoon we drove to the David Sheldrick Wildlife Trust (www.sheldrickwildlifetrust.org) (DSWT), located just inside the Nairobi National Park. The access had moved to the Banda gate since our last visit, so we got that wrong at our first attempt, ending up at the wrong gate and having to back track. We had been booked for the evening visiting hour for foster parents, and when we arrived at 16:30, we asked the keepers if we could meet our friend Tal, who works for the Trust. It was pretty cool to be let in early, as everybody else had to wait outside until 17:00! It was great to see Tal again after nearly three years. 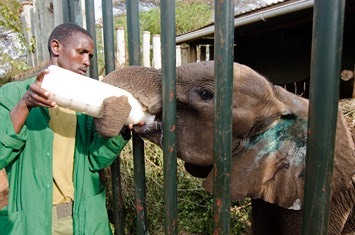 She took us to meet Rombo, a little male elephant of approximately 2 ½ years, who had arrived from Tsavo West only four days earlier. He had been speared through his left ear and into his neck, and the wounds were covered in green clay. He immediately came to sniff Mick and totally ignored Maren - boys! 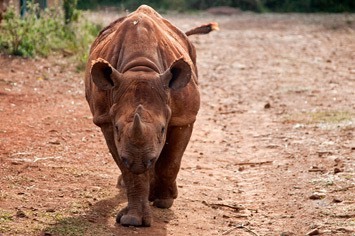 Tal was called to continue some work, so we were left waiting for Solio, the 1 ½ year old black rhino, who is actually quite big already! She came striding towards us and only turned off at the last moment, lured by her bottle of milk into her stockade. 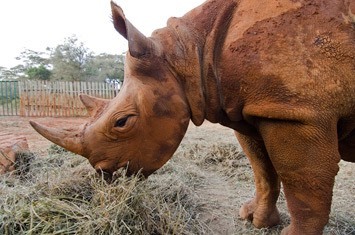 Maxwell, the older blind rhino in the stockade next door, made funny little baby-like squeals, which just don’t sound like a rhino at all! 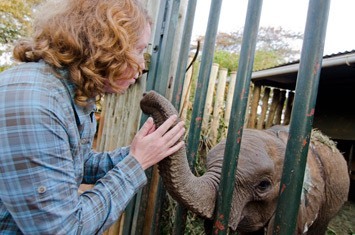 We spent some more time with Rombo, who eventually let Maren blow down his trunk in an elephantine greeting. Given what he had just been through, it was amazing how calm and trusting of humans he was. 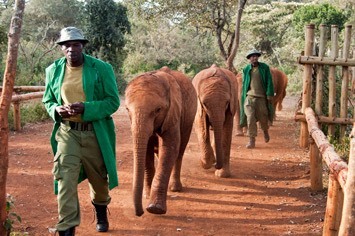 Eventually, head keeper Edwin and the other guests arrived and soon after four elephants, including little Naipoki came running out of the bush. We followed them to their stables, where they were fed their milk bottles. Only a few minutes later, the bigger orphans arrived, running to their stables, scattering everybody in their way! 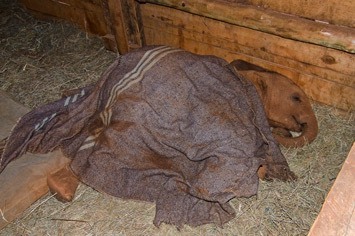 Another recent arrival, Dabassa from Tsavo East, was very sweet, but nowhere near as trusting of people as Rombo. We watched the elephants for a bit, chatted with the keepers and took some photos, although that was rather difficult as the stables were quite dark. Tal briefly appeared before leaving altogether for the day, and we exchanged telephone numbers and agreed to meet again when we were back in Nairobi. 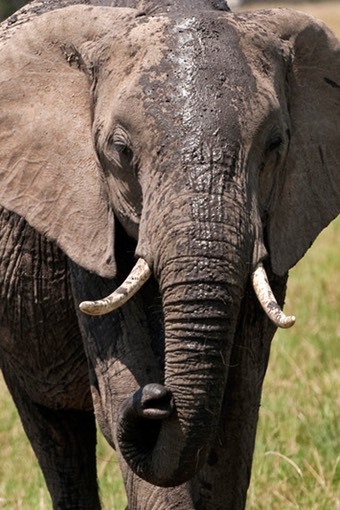 At 18:00 we said farewell to Rombo, who let Maren blow down his trunk again. We hope that he will make it and that his condition will improve soon. 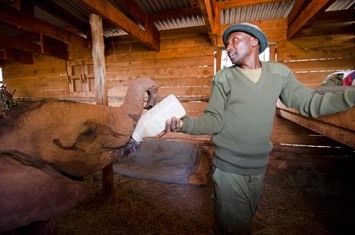 As soon as we can, we’ll add him to our own personal herd of fostered elephants! We definitely fell in love with him there on our first meeting. We had another chat with Edwin, who was very grateful for the bag full of old tights. Most of these were from Maren’s late grandmother, and we were wondering what she would think about her tights being wrapped around little elephants – they use them as girths to hold their blankets in place. 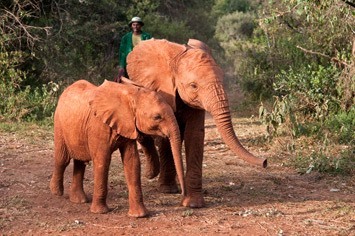 It was great to start our first day in Kenya by visiting the little elephants and seeing the great work the Trust is doing in rescuing and raising them. 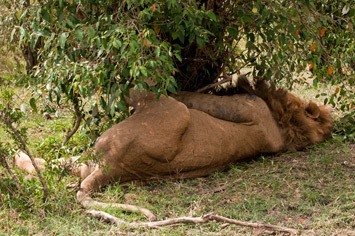 We then drove back through the crazy Nairobi traffic to the campsite, had dinner and crashed out. Later in the evening, neighbours appeared in the dorm, but they were not too loud and we slept very well. Not surprising after a sleepless night on a plane. We got up at 6:30 and re-packed the car. We paid the campsite, deciding not to return there when we returned to the big city – we’ve stayed in better places in Nairobi. We had breakfast of some enormous chocolate croissants at the shopping centre in Karen. After filling up the car with petrol (yes, petrol – the original diesel engine had been replaced by a big gas-guzzler) we headed towards Dagoretti, where Charles lives. We did our fruit and vegetable shopping in the local market. One little girl was terribly fascinated by our white skins and kept touching us and wanted to be lifted on Mick’s arms all the time. She couldn’t speak much, but she kept repeating the word for “white people” – “muzungu”! All the ladies cracked jokes that we couldn’t understand, but obviously they had a lot of fun! We briefly met Charles’ wife Victoria, and she invited us to their house when we next return to Dagoretti. 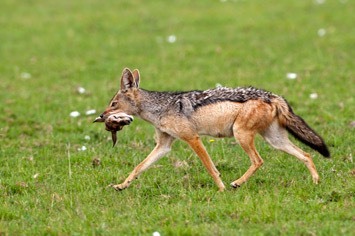 Then we were on our way to the Masai Mara! We drove down the Great Rift escarpment, but it was very hazy and so we didn’t stop to take any photos. The road was newly tarmacked until Narok (probably thanks to the Chinese). We had lunch at Narok, filled up the car again and continued. From Narok onwards the drive turned rather gruelling – there were more potholes than tarmac! It was a very challenging and tiring drive, and it seems incredible that nobody has bothered improving this road given it goes to one of the most visited reserves in the whole of Kenya! Later the potholes turned into a stony piste, which was easier to drive on but still very bumpy. We had a bet going about which animal we would see first, and all three of us got it wrong. It wasn’t giraffes, wildebeest or zebras after all; it was a group of vervet monkeys! 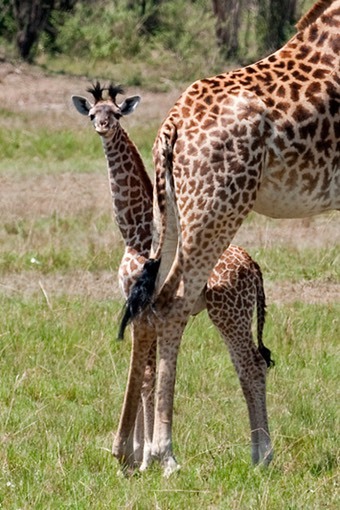 Afterwards, we saw two large herds of giraffe. 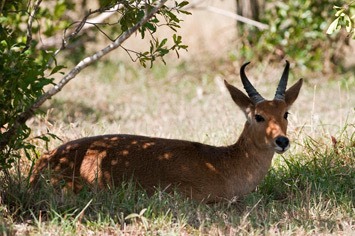 One animal crossed the road and was easy to see, but those feeding on the bushes were very well camouflaged. 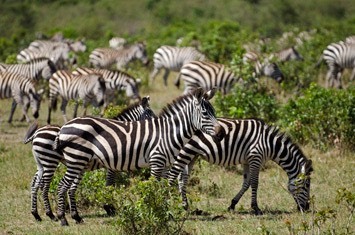 Then we came across many herds of wildebeest and zebras. We must have seen thousands of wildebeest, including our first wildebeest crossing (albeit only crossing the road!) before we even arrived in the reserve. Later we crossed a small river and drove parallel to the reserve’s boundary. We arrived at Crocodile Camp just outside the Talek gate at 16:45. The camp was nearly empty and very quiet, so we chose a prime spot not too far away from the toilets and showers (with hot water heated by a charcoal fire underneath a big water drum) and the kitchen building. Some helpful Masai put our tents up for us. The camp is right on the Talek River and we watched an absolutely huge crocodile on the other bank. 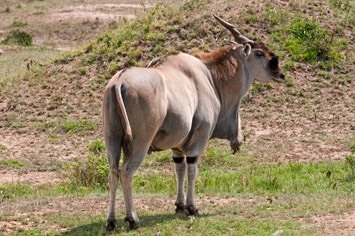 We could also see some of the animals in the reserve. 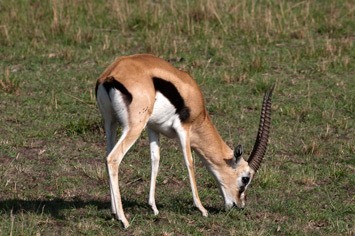 Other mammal species seen today were Grant’s and Thomson’s gazelles and impalas. We turned up at the Talek gate first thing in the morning to pay our fees, which was a rather shocking 80 US Dollars per person per day! 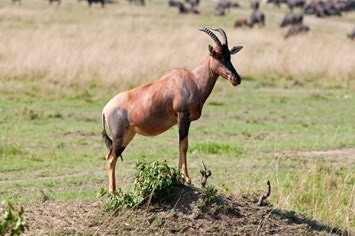 The rangers at the gate suggested that we should head towards the Keekorok area to see the wildebeest herds. 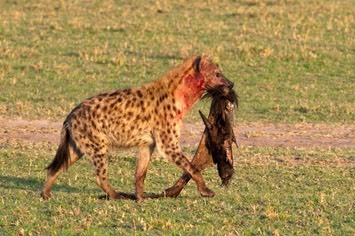 First we saw a hyena carrying the severed head of a young wildebeest, which looked rather gruesome! 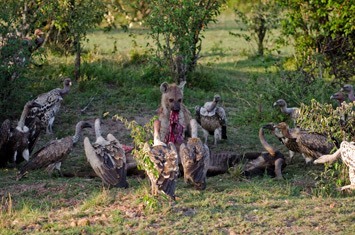 Then we came across a wildebeest carcass, which was jealously guarded by a hyena and lots of vultures. 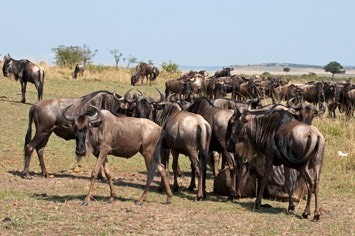 But then we saw the living wildebeest – and plenty of them! 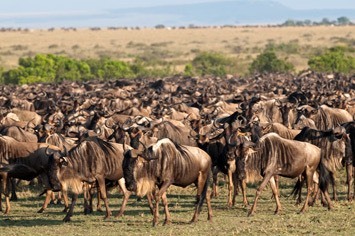 There were wildebeest as far as one could see! Absolutely everywhere! 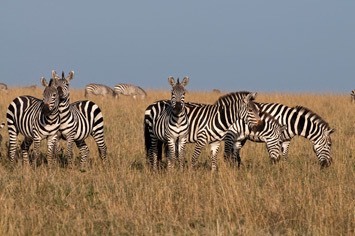 There were vast numbers of them, with small groups of zebras dotted about among them. 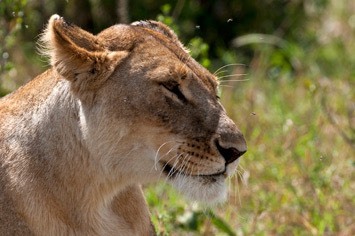 We headed across the plains and saw two lionesses out in the open. They were on a kill, but moved away when we and another car approached them, so we left immediately in order not to disturb them. 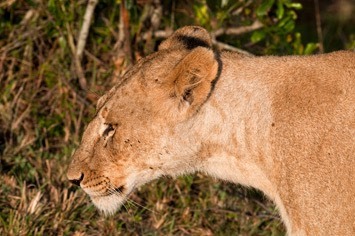 A bit further on, near a lugga (a shallow ravine created by a seasonal stream), we saw several cars watching a lioness. 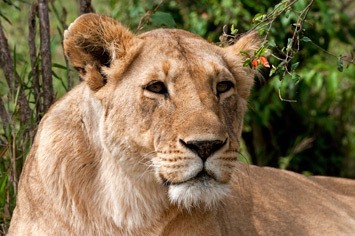 As there was no space for our car, we were just about to leave, when the lioness got up and walked towards us. But she was not alone – there was a tiny, adorable cub with her! 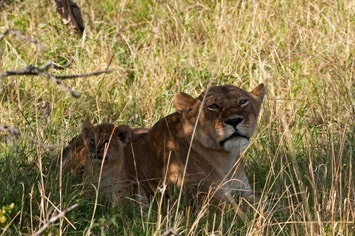 Mum flopped down under a bush, while the cub started exploring its surroundings. 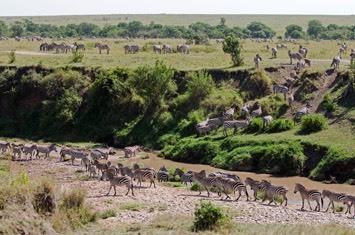 We then headed towards the Talek River, where we found large numbers of zebras. 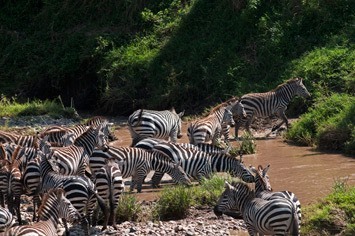 We even saw a zebra crossing, although it wasn’t one of the spectacular crossings as the river was very narrow and only knee-deep. Nevertheless, it was quite a sight, which we could enjoy all by ourselves! We spent a lunch break at the camp and then set off again in the afternoon. 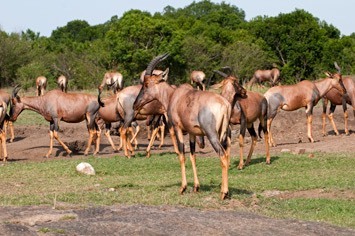 We headed south again, and there were still plenty of wildebeest. The driver of another car told us that there was a cheetah sighting, and we eventually found it on a hillside. 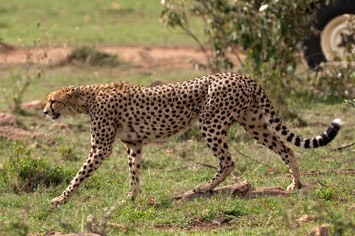 Unfortunately, the light wasn’t terribly good and no animals came close enough to raise the interest of the cheetah. It was also very windy, and a second car took the best spot. On the way back we somehow managed to lose the track we had taken earlier, and because we didn’t quite know where we were and were running a bit late, we couldn’t really stop long for a lion, lioness and two young cubs, nor for an alliance of three male cheetahs, which later turned out to be the famous “Honey’s boys”, which we had also seen on our last visit to the Mara. But both of these sightings had very many cars with them, so it didn’t feel quite right to hang around anyway. The way home seemed to be much longer and we joined the main road much further to the east than expected. On the drive back to camp we also saw our first wild elephants, but they were far from the track and it was getting too dark to photograph. We decided to change the settings in our GPS in order to record and display our tracks, so that we always knew how far and in which direction the camp was from our own location. 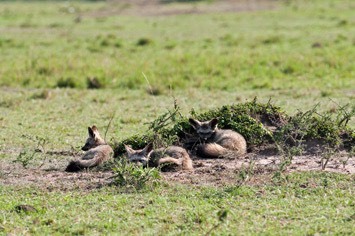 Other animals seen today included a reedbuck, buffalo, banded mongoose and two hyenas having a mud wallow. Today we decided to follow the Talek River downstream to its confluence with the Mara River. 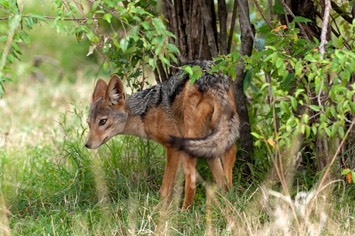 We saw black-backed and side-striped jackals and again very, very many wildebeest and zebras. In a lugga we found a single lioness, but she seemed to be sick and couldn’t easily get up, so we left her in peace and moved on. 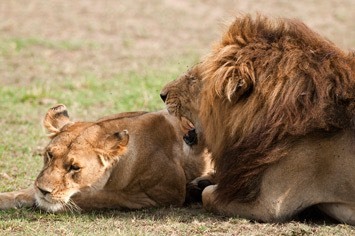 A bit further on we came across a pride of four lionesses, but they were all rather sleepy. 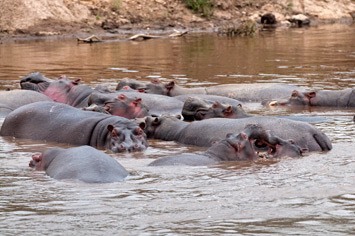 Eventually, we reached the confluence of the Talek and the Mara rivers, where we found a big group of hippos in the water. 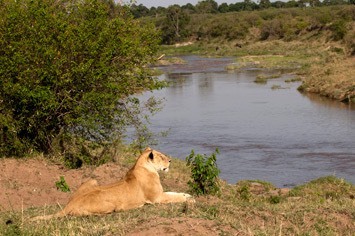 We then turned south, downstream along the Mara River, where we saw three more hippos and then a beautiful lone lioness perched on a grassy promontory overlooking the river. 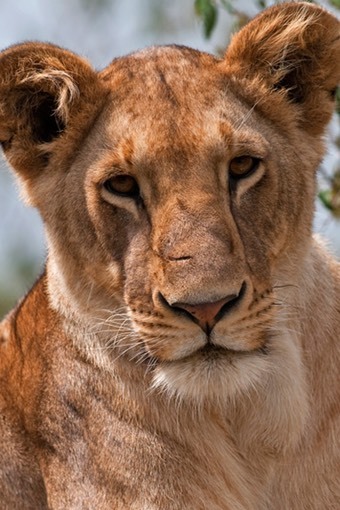 It was fantastic for photography, as there was nice light and the lioness appeared to be in prime condition and didn’t mind us approaching. 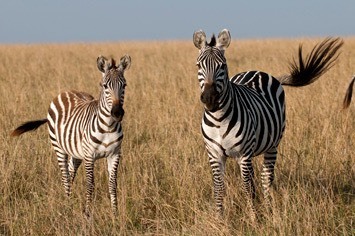 She was watching a group of zebras on the other side of the river and eventually she followed them along on our side. 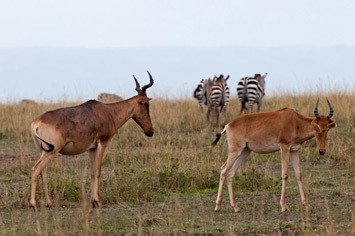 The plains were full of wildebeest, zebra, Grant’s and Thomson’s gazelle, Eland, Topi, Coke’s hartebeest, impala and some large groups of giraffe. 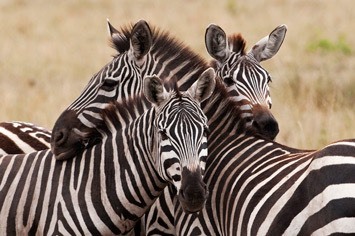 It is difficult to adequately describe this spectacle, except that there were lots of animals wherever we looked! 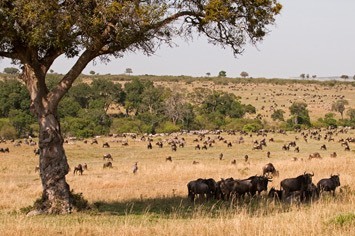 Before we began our trip we expected to come across the occasional very large and rather dense herd of wildebeest, but instead we were presented with loosely scattered wildebeest everywhere. It was truly stunning! 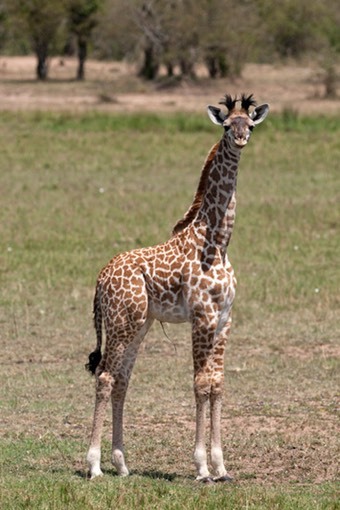 We then came to a more bushy and forested area, where we spotted three baby giraffes and some elephants. 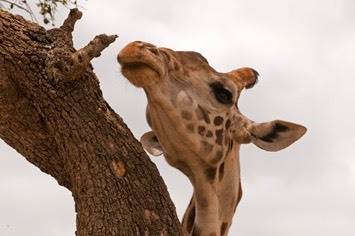 The elephants eventually disappeared into the bush, while more and more giraffe walked out of it. 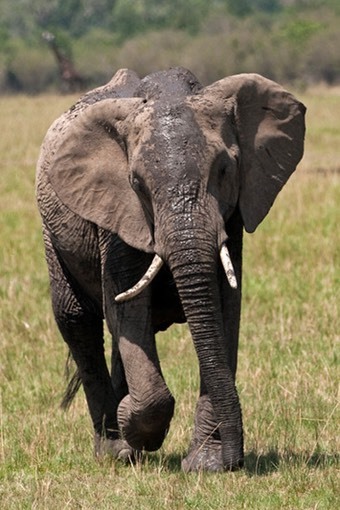 A lone elephant approached quite calmly across open grassland, where he had plenty of space to walk around us. But just as he got to within about 100 metres, something in his brain suddenly snapped, and he mock-charged us trumpeting like a crazy thing! Maren, who was taking photos out of the roof hatch, very quickly dropped back down inside! 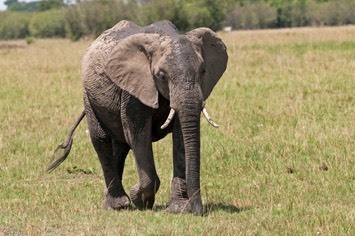 Fortunately, the elephant ran straight past our car and ran towards the bushes, scattering lots of giraffes in his wake. He obviously got up on the wrong side of bed in the morning - we could still hear him trumpeting and charging about in the bushes quite a while later. 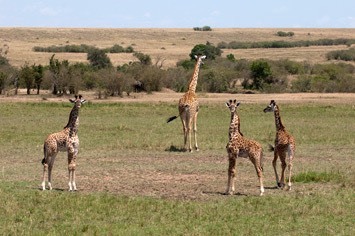 Thanks to the mad elephant we could then see about 25 giraffes out in the open, which was quite spectacular. 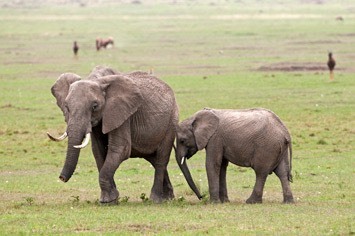 We then came across two female elephants with four relatively young calves. 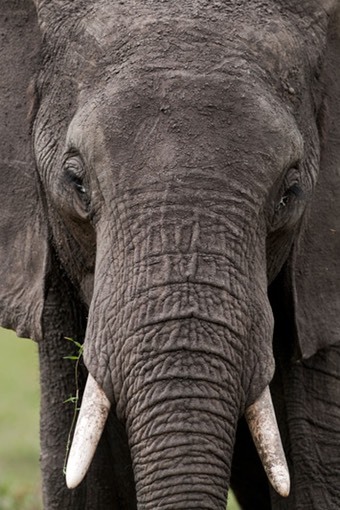 The matriarch wasn’t too happy about us looking at her family and gave us a warning ear flap and trumpet before heading in the direction of the mad elephant we had met earlier. 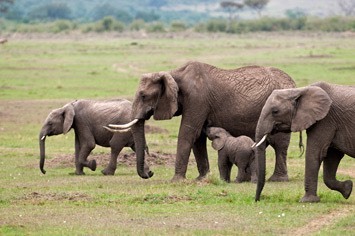 We were wondering if these elephants had recent bad experiences with people, as the group composition with more calves of the same size than adults was rather unusual. Anyway, it seemed best to treat all Mara elephants with the utmost respect, not knowing if there weren’t more pissed-off elephants about! 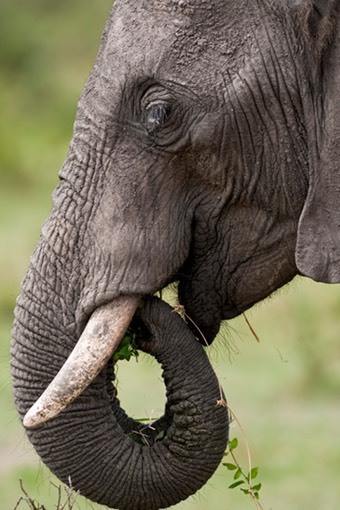 Not wishing to encounter more grumpy elephants in dense bush we headed back out into the open and had lunch under a lone acacia tree, after evicting some hapless wildebeest from their prime siesta spot. 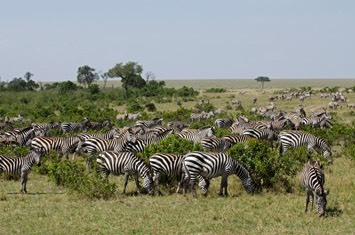 It definitely was a lunch with a view, with wildebeest and zebra everywhere! 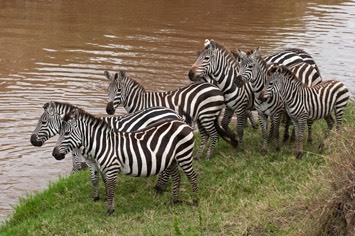 We chose to head back along the Talek River towards camp and spotted a group of zebra drinking from the river. Two brave individuals swam across the river, but the others stayed put. 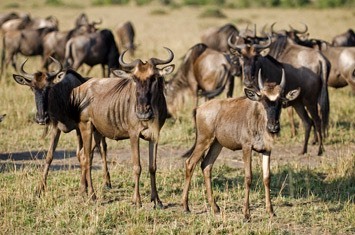 A pretty large group of wildebeest was contemplating a river crossing, but decided against it in the end. We spotted two safari cars on the other side of the river, and all their customers were intently staring at something in the bushes. Suddenly a caracal run out of the bushes, only to disappear in the next ones further down the river! 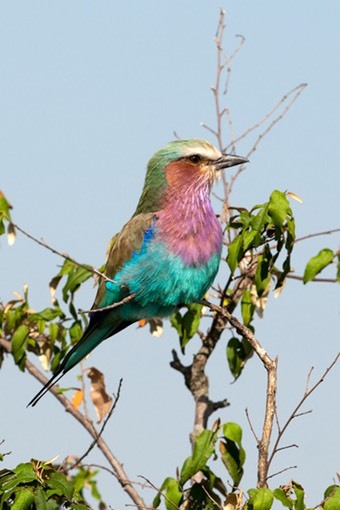 Wow, that was a great sighting, even if it only lasted a few seconds! We also saw some very distant lions on the far bank, including a male with a big mane (which had eluded us throughout our last trip). 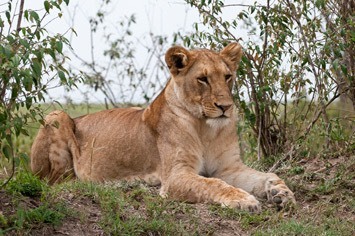 We came across three of the four lionesses we had seen earlier in the morning, still lazing around in exactly the same spot as before. They let us approach pretty close, which was great. 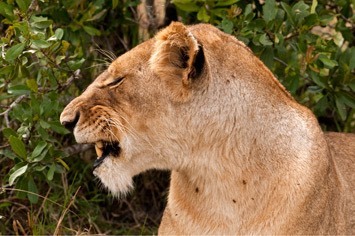 The sick lioness was still in her bush, too. 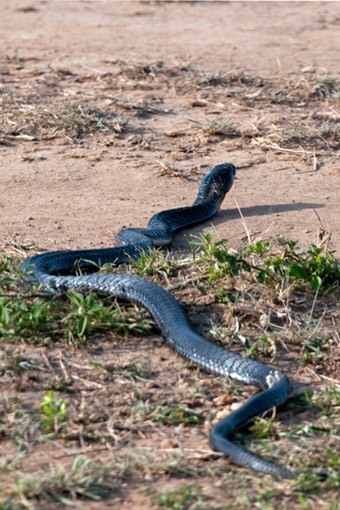 Other animals seen during the day included some dik-diks, hartebeest, three bat-eared foxes, hyenas and a hippo in a waterhole quite some way away from any river, a crocodile in the Talek River and a large cobra. Just when we returned to camp it started to drizzle, but fortunately, it didn’t start raining in earnest. 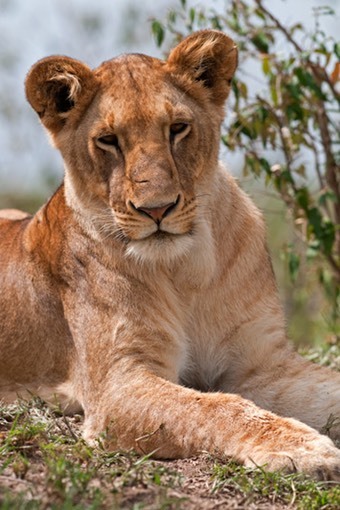 We decided to spend this day on the northern side of the Talek River and head towards Governor’s Camp to check out all the famous big cats that frequently hang out around there. 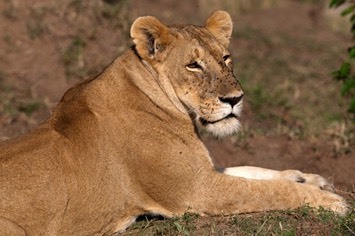 Soon after entering the reserve on the northern side, we saw several cars parked next to a big male lion and two lionesses. 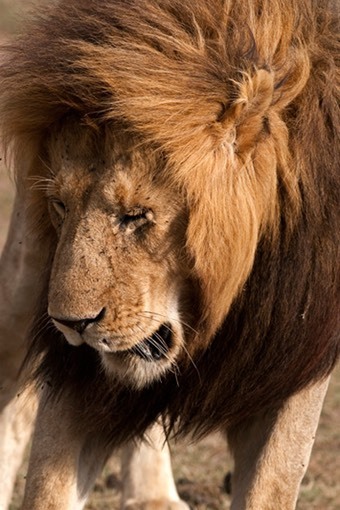 He had a great mane, but the light was still too poor to take any sensible photos, and the lions were lazy and not doing anything anyway. 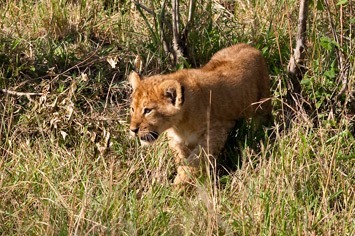 We headed on and soon found two more lions, whom we suspected to be quite young. 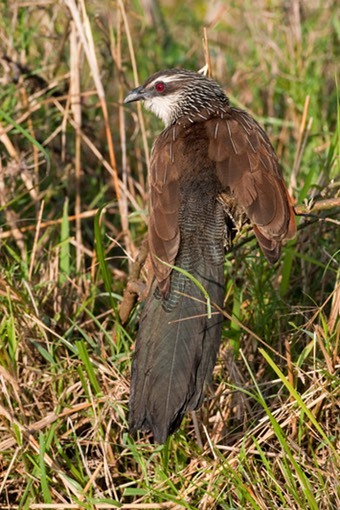 One of them suddenly went into stealthy hunting mode, only to flush out a big ground hornbill! We had been told by one of the Masai in the camp that a leopardess and her cub were frequently seen near the double crossing of the Olare Orok and another river. As leopards have always proved to be rather elusive for us, we decided to check it out, but instead of a leopard we came across more lions! 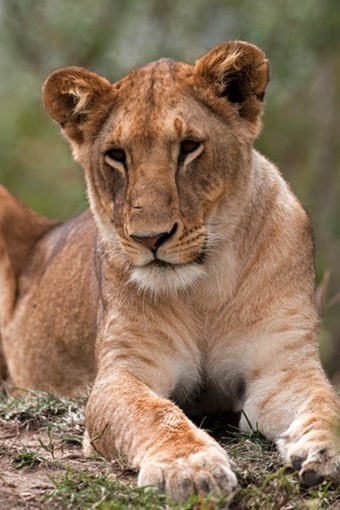 Three lionesses and a young male were resting under a tree and a couple of hundred metres away a beautiful blonde-maned lion was lying above the stream. 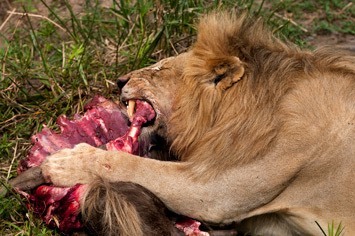 After some yawning, the male eventually got up and started feeding on a wildebeest carcass he had stashed next to the little river. We could hear the crunching of the bones and it was a little bit gruesome, but we thoroughly enjoyed our front row view point. Only one other car turned up but left soon after, so we could enjoy this spectacle more less all by ourselves! 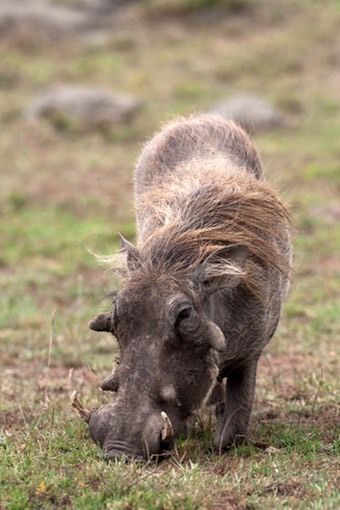 We continued around Rhino Ridge, where we didn’t see much game except for plenty of warthogs and some banded mongoose. We must have been right at the border of the reserve, but eventually found a way that took us towards the airstrip. 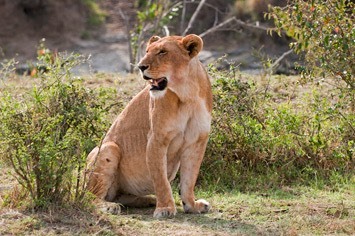 In a lugga we found more lions, again all by ourselves – this was certainly our “lion day”! 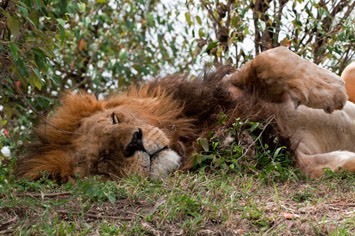 Two males were asleep under some bushes, and we later identified one of them as Romeo, another “Big Cat Diary” star. His sidekick was most likely his best mate Clawed (ouch!). All Romeo did was to turn around and continue sleeping, so we checked out some of his ladies and youngsters lying under nearby bushes. We could see at least three more females nearby, and two of them we could approach really closely to take some fantastic photos of them. They were posing nicely in sunlight, keeping their eyes open for most of the time! But as it was obvious that nothing exciting would happen anytime soon, we carried on. The next group of elephants we approached warily, after our meeting with the crazy guy the day before. 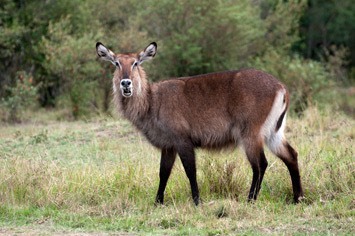 However, one young male came closer and closer while browsing, and approached to within a few metres of our car. 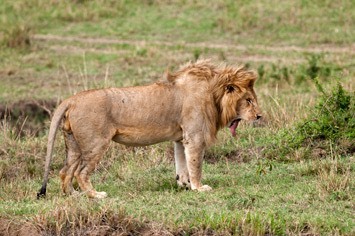 Fortunately, he stayed calm and restored our faith in the Mara elephants somewhat! There were plenty more elephants around, but none very close. We went looking for cheetahs up on Rhino Ridge, but didn’t find any. Instead we came across more elephants on Paradise Plains. 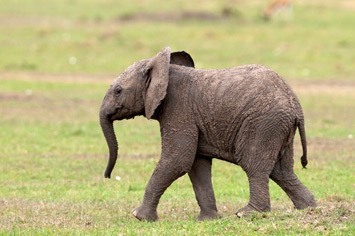 There were two families; one included a tiny calf, which was exploring everything it came across. 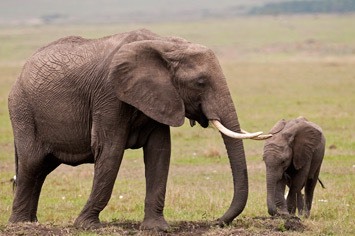 In the other family there was a female, who was, sadly, missing the bottom third of her trunk. It looked like she must have lost it in a snare. It was a struggle for her to feed: she had to lean down and try to somehow hold onto the grass before plucking it out with the help of her foot. She obviously had learned to cope with her disability, but it must make life quite tough for her! She had a fairly large calf with her, who insisted on suckling several times and screamed in protest when mum wasn’t obliging. 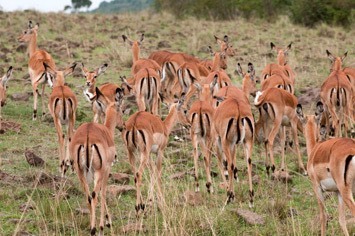 On we went through some bouldery areas where we mainly saw impalas. 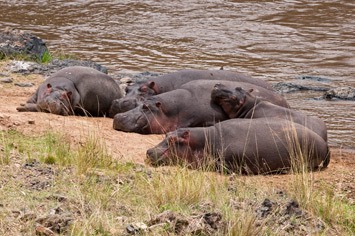 We found a nice spot to have lunch overlooking the Mara River and its resident hippos. 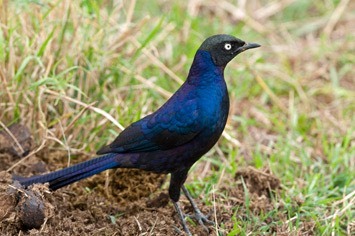 We were joined by several glossy blue starlings, hoping for little bits of our food. 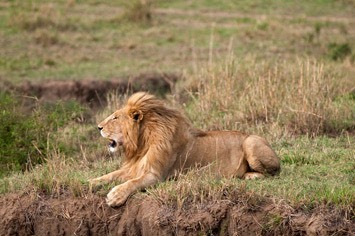 On the return journey we kept close to the rivers and checked on the lions at the double crossing. 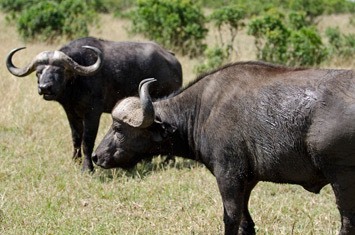 Buffalos had taken the prime spot under the bush and we only saw one female. We kept looking for leopards all along the river, but were again unlucky. 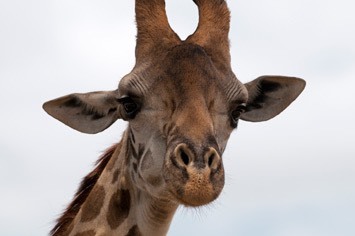 Instead we had a great photo session with some Masai giraffes, who came really close to the car. 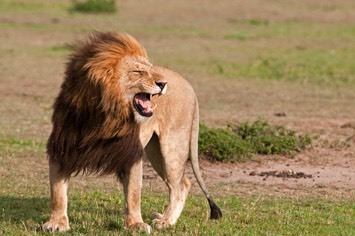 The two young lions from early in the morning were still there, but like most lions, they were rather inactive. We could then see a large congregation of cars, so went to check it out. 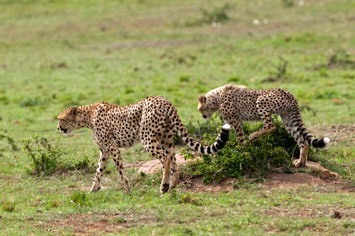 It turned out to be a cheetah mum and a medium-sized cub. 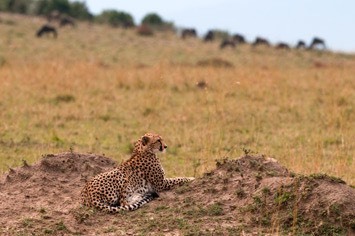 Some of the drivers were not very well behaved, and as soon as the cheetah moved they moved alongside her. 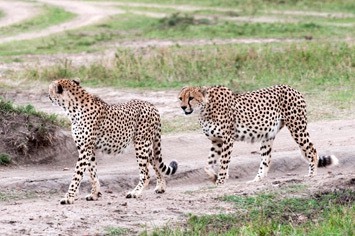 One of them drove straight into our field of view, obviously only thinking about his customers and not about us who had waited patiently for the cheetah to move so that we could see her better. The cars rather crowded the two cats, so they cleverly went and hid in a hollow area where nobody could see them. Good for them! 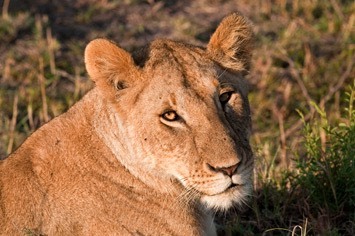 Following the coordinates we had taken in the morning, we went to check out the three lions we had seen at first light. They were still in the same spot and for the time being there were no other cars around. 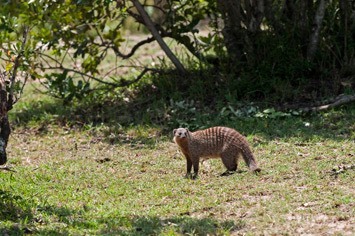 The male got up and we followed him. 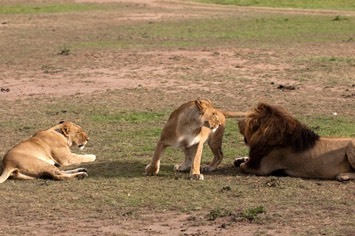 The two lionesses soon followed and both did their utmost best to seduce him, slinking across his path, rolling over and giving him the come-on. 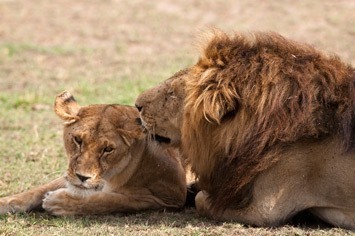 Naturally we hoped to see these lions mating, as this must be a very spectacular event. However, the male was obviously rather shagged out, and didn’t want to know. 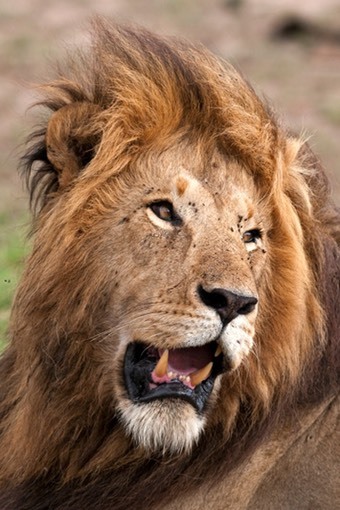 We thought he was rather wimpish, but later we learned that he and the two lionesses had been mating for several days already! 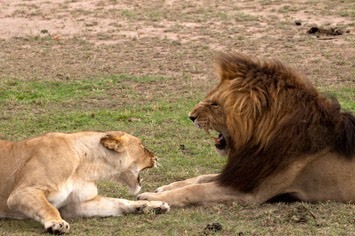 It seems we caught them right at the end of their honeymoon, when he was apparently convinced that he had done his duty and had only a growl and a slap with his paw left for his ladies! Throughout the late afternoon the skies in the east got darker and darker and the wind picked up while we were with the lions. When they got up and moved away, it was our cue to head back home. And good job, too, as the heavens opened just before we came out of the reserve! 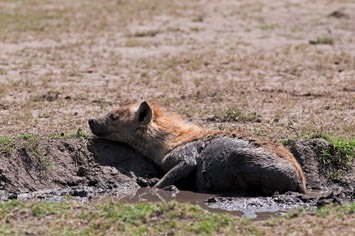 Fortunately, we were on the main track already, because we could hardly see through the torrential rain and the ground turned muddy very quickly. We also discovered that the car was leaking in some places… We made it to the camp in one piece, but we were extremely glad that we hadn’t been any further away when the heavens broke. It continued raining hard for several hours. Originally we had planned to stay in the Masai Mara for another two days, but after this rain it didn’t seem worth it, as the driving would be a lot harder. We felt we had seen what we had come for and we didn’t want to spoil it by getting stuck in the mud and not getting any nice pictures due to grey skies and rain. Therefore we decided to break camp in the morning and head back to Nairobi earlier than planned. 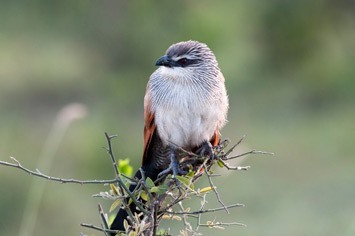 Other animals seen in the Masai Mara in the last days included Thomson's gazelle, impala, Topi, Eland, waterbuck, buffalo and of course plenty of birds. 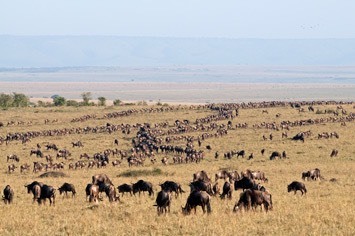 In retrospect it was definitely worth coming to see the great migration. It was indeed a truly awesome spectacle! 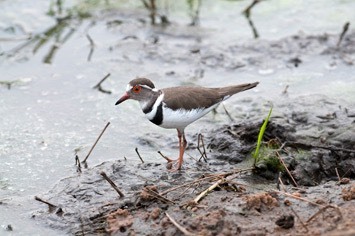 And although we didn’t see a big river crossing, we had many great sightings of a lot of different species. With the exception of some of the cat sightings, we didn’t come across other cars all that often, although there were obviously plenty of them around. 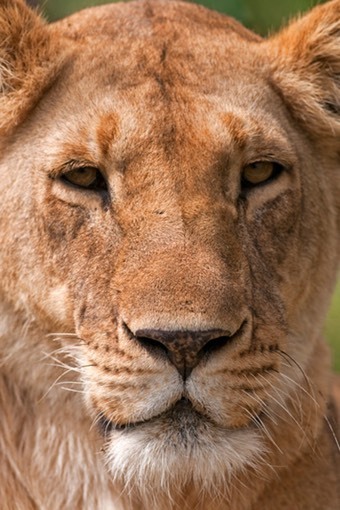 We were also very pleased with our lion encounters and managed to take lots of photos and video. Crocodile Camp was a great base, as it has hot showers, “proper” sit-down toilets and a kitchen area with a roof, so that we could spend our last evening watching the rain from a dry spot, rather than hiding in a wet tent. After the previous evening’s heavy downpour there were a few more showers in the night and it was very wet and muddy in the morning. It was still overcast, grey and cloudy. Although it seemed a shame to leave this amazing place and all its wonderful animals, we felt that we had seen the best of it and that it was the right decision to leave the Mara. 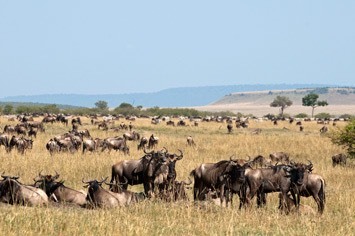 Mick dryly commented that the Mara in this weather was like Wales with wildebeest. 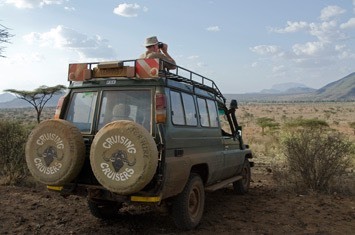 Due to the ever-present mud we couldn’t return to Nairobi the way we had come, but chose to drive on the main gravel road through the reserve to the Sekenani gate and from there to Narok. The rangers were kind enough to let us go through the reserve without charging us for another day, which would have been a very expensive detour. Even from the main track we saw two lionesses and went on a futile chase of some rhinos and leopards that had been seen not far away. As there were too many cars there and nothing really to be seen, we decided to press on out towards Nairobi. It was drizzling nearly all the way back. The drive was pretty tiring and at least as bad as when we arrived, possibly even worse, due to the rain. We arrived in Nairobi in the early afternoon after 6 ½ hours of driving with only a lunch stop in the bush after passing Narok. 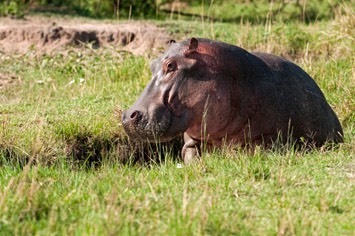 This time we decided to stay in Karen Camp (www.karencamp.com), which had been recommended to us by Tal. Karen Camp is basic but comfortable and sociable, and it had some wonderfully hot showers, which we occupied for quite some time! We had a twin room and Charles had his own little room. It is also possible to camp in the grounds, but we felt like a wee bit of luxury. We made a quick trip to the KWS shop at the entrance to Nairobi National Park and bought a map of Meru and some postcards. Back in camp we met James from Rover Safaris (www.roversafari.com), through whom we had rented a car on our previous trip. We had a bit of a chat with him, had a meal from the bar and went to bed early.